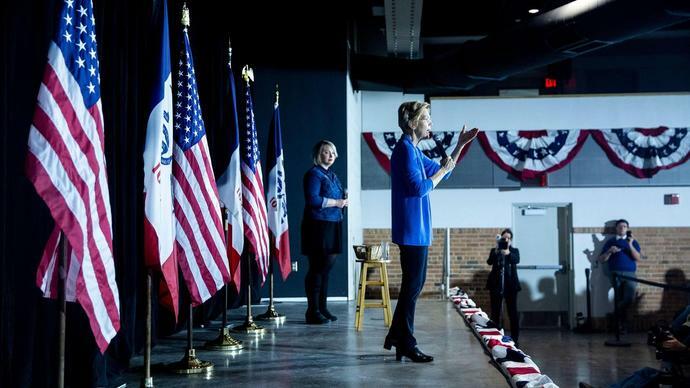 CEDAR RAPIDS, Iowa - On her first full day of campaigning since announcing a run for president, Massachusetts Sen. Elizabeth Warren suggested her 2020 Republican opponent may not be President Donald Trump. "When we get to 2020 - Donald Trump may not even be president. In fact, he may not even be a free person," she said in her first eastern Iowa stop of the day. It marked the first time Warren has targeted the president directly while at an event in the early caucus state. During a multi-day tour earlier this year, Warren hardly talked about Trump at all - and she even avoided mentioning his name. Despite taking an early direct jab at the president on Sunday, Warren said Trump is the symptom of a bigger problem. She quickly transitioned into talking about her values - something she later told the Des Moines Register will be the focus of her campaign. Warren, calling it a "fair and reasonable question," said she will let special counsel Robert Mueller finish his investigation into Russian interference in the 2016 election before deciding. On the one hand, she said, the investigation is almost finished, and on the other, a completed investigation will let Congress - and the public - see all available evidence before it's taken to a vote. "I'm not somebody who picked up this issue because it polled well," she told the Register. "This is what I've been working on for my whole life. It's been about documenting the hollowing out of America's middle class. It's about how people work harder than ever but the path is getting rockier - and even rockier for people of color.